Pipe Prop, manufactured by JMB Industries of Fort Worth, Texas, is approved for Directory Listing IAPMO IGC 331-2016 by the International Association of Plumbing and Mechanical Officials (IAPMO) for Uniform Plumbing Code (UPC). Pipe Prop earned this prestigious Listing Certification through years of extensive testing and proven performance under the most severe weather conditions. Pipe Prop had already been recognized with two NOA’s (Notice of Acceptance) as the only “Miami-Dade Approved” pipe support system for hurricane zone applications. 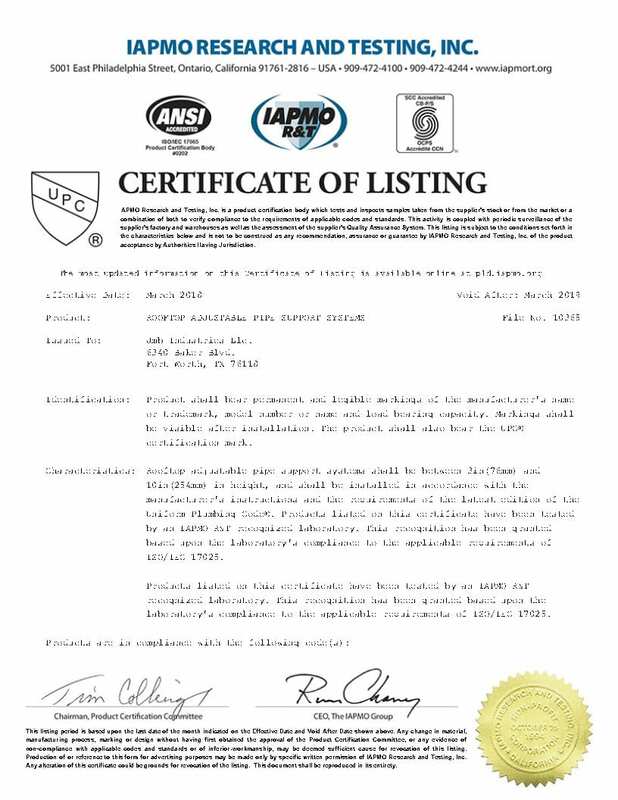 “The IAPMO UPC Certification reinforces that PipeProp has once again been proven to be the best choice for Architects, Mechanical Contractors, Municipalities and Roofing Consultants” said Jim Brown, inventor of PipeProp and owner of JMB Industries, LLC. The certification includes the APS-1, APS-2 and the USPP models. Go to www.pipeprop.com to review models, product certifications, specifications, test results and to locate a distributor in your area. For more information please contact us at 888-590-0120.